All parts of this winamp skin are done. Note. If your using a version prior to 2.X you may not be able to see the full Skin package. 2. 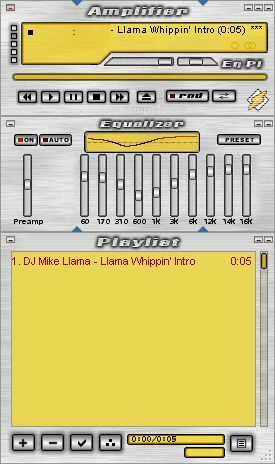 You will need winzip or an equivalent software package to install the skin if prior to Winamp is version 1.X. i. If another directory is used you will have to point the skin browser to use an alternate skin directory location. ii. To do this Press Alt+S and Click the button "Set Skins Directory". c. Proceed to Step II. 3. Select the Skin you wish to use. 1. You may use and do whatever the hell you like to my skin. 2. If you change or modify it please just drop me a line through E-Mail. 3. I would greatly appreciate it if you include the new skin that you made. 4. You can order a Skin developed for you or your company for a nominal fee (See Corporate Developement).